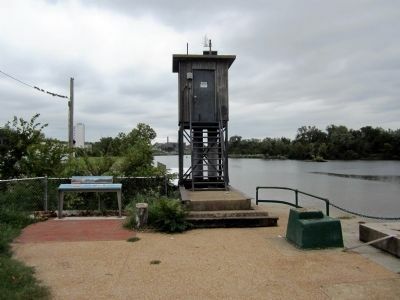 Rocketts is the river frontage and community named for Robert Rockett, who operated a ferry across the James River beginning in the 1730s. Over the years, tenant laborers and merchants filled the floodplain with clusters of small houses and commercial establishments. Between 1790 and 1830 free black residents and immigrants from Germany, Scotland and Ireland also settled here. Growing opportunities in trade gradually made Rocketts a prosperous world seaport. Shipping lines connected Rocketts to Philadelphia, New York, Charleston and various South American and European ports. Tobacco and flour were the main exports. 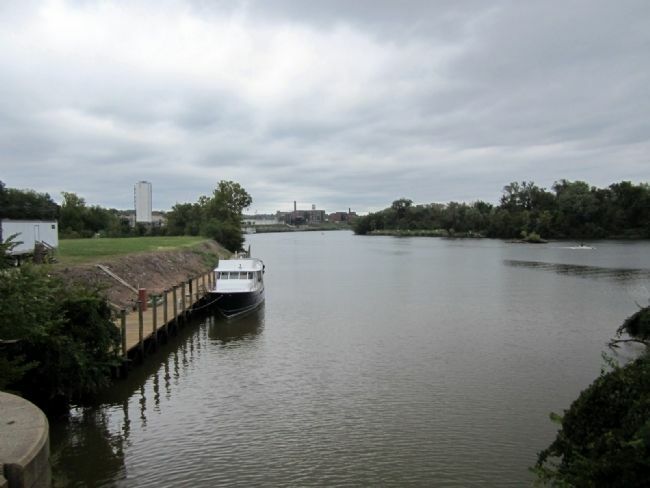 Begun in 1862, the Confederate Navy Yard occupied both sides of the James River, including the community and port of Rocketts on the north bank. The Yard was the base, construction site and headquarters for Admiral Raphael Semmes’s James River Squadron. The Squadron included the ironclad CSS Virginia II, which was built here. It was the successor to the first CSS Virginia, which fought with the USS Monitor. The Confederate Navy Yard also produced prototype artillery mounted on a railroad car for General Robert F. Lee’s use at the Battle of Savage’s Station on June 29, 1862. On April 3, 1865, Confederate troops burned the yard and destroyed vessels as a part of the evacuation of Richmond. Powhatan, paramount chief of Algonquian-speaking Indians of Virginia’s coastal plain, was born in a town east of here. Powhatan’s supremacy in this region provided order and protection for the tribes in his chiefdom. Virginia’s Indians lived in towns, sore protected by wooden palisades, and surrounded by fields for growing vegetables, grain and corn. In 1607, when Jamestown’s colonists were foraging for food north of the settlement, Captain John Smith was captured and brought before Powhatan at his center of power on the York River. Smith later claimed that Pocahontas, Powhatan’s favorite daughter, intervened to save Smith. Powhatan “adopted” Smith into the chiefdom and allowed him to return to Jamestown. 2011 by Virginia Capital Trail. Location. 37° 31.522′ N, 77° 25.24′ W. Marker is in Richmond, Virginia. Marker can be reached from the intersection of Dock Street and Pear Street, on the right when traveling east. Touch for map. Marker is at or near this postal address: 2803 Dock Street, Richmond VA 23223, United States of America. Touch for directions. Other nearby markers. At least 8 other markers are within walking distance of this marker. City Locks River Gauge (here, next to this marker); Coffer Dams (within shouting distance of this marker); Great Ship Lock (within shouting distance of this marker); Rocketts Landing (within shouting distance of this marker); Confederate Navy Yard (within shouting distance of this marker); a different marker also named Great Ship Lock (within shouting distance of this marker); a different marker also named Great Ship Lock (within shouting distance of this marker); Welcome to Chapel Island (about 400 feet away, measured in a direct line). Touch for a list and map of all markers in Richmond. More. 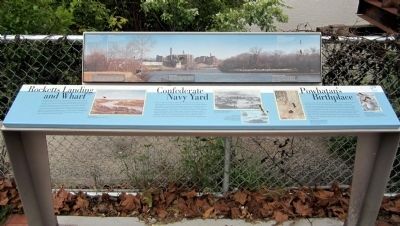 Search the internet for Rocketts Landing and Wharf / Confederate Navy Yard / Powhatan’s Birthplace. Credits. This page was last revised on June 16, 2016. This page originally submitted on September 22, 2011, by Bernard Fisher of Mechanicsville, Virginia. This page has been viewed 1,228 times since then and 18 times this year. Photos: 1, 2, 3, 4. submitted on September 22, 2011, by Bernard Fisher of Mechanicsville, Virginia.